E Komo Mai. Welcome to the Vintage Beach Cottage! B.M. 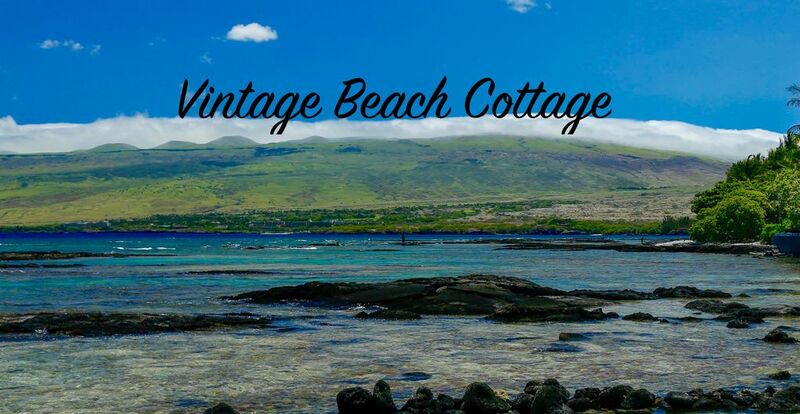 says, "The vintage Beach Cottage is our favorite place to stay on the Big Island. "A.M. says, "Private and quiet." J.S. says, "when I first walked into the cottage, I felt like I'd just entered my dream vacation." Indeed, we offer a unique one-of-a-kind vacation destination for travelers to Puako. Our 7,000 sq. ft. turn-key property is an immaculate, well-maintained, and well-stocked one-bedroom cottage located just across the road from one of the best fingerling reef in Hawaii. Explore inviting near-shore tide pools for ocean treasures. Enjoy a swim in the tropical waters, a walk along the shoreline, sea shelling and watching dolphins, turtles, manta rays, whales, occasional monk seals, and green flash sunsets. The open floor plan of the interior includes a well-equipped gourmet kitchen, dinning room, living room, laundry/service area, and bathroom. A comfortable king-size bed awaits you in the bedroom, with custom bed dressings and French doors that offer a view of the grounds and ocean beyond. Ocean breezes and the soft scent of stephanotis flow through the French doors where you will drift to a restful sleep under the ceiling fan. Summer in sub-tropical Hawaii is warm because we are located near the Tropic of Cancer. Do not expect our Hawaii sea level property to have the same climate as your home. We offer optional air conditioning use for a fee. The "bedroom window" A/C unit is not ducted whole house central air-conditioning . Guest may choose to option "in" for A/C use on arrival and pay. Preparing an island-style meal is made easy in the fully equipped kitchen, complete with spices, cookbooks, and any pots and pans or serving dishes you will need. The gas BBQ outside is a great way to grill the local catch of the day. Dinning under the stars or in the comfortable dinning nook is a perfect way to enjoy your island meals. Alternately, you can visit several wonderful restaurants nearby. Additionally, orchids and houseplants located throughout the house ad a feeling of home. The living and dinning areas are decorated with a mixture of restored vintage rattan furnishings, custom Hawaiian island decor, and art. Craftsman details in this home include vintage wood floors, koi-wood cabinetry, wood paneling, tile floors and counters. These furnishings are combined with provisions, picnic gear, Hawaiian books, novels, games, an entertainment center, and other resources to provide guests a truly relaxing environment. Park your car in the shade of the garage, which allows you easy access to a beach-equipment box complete with flippers, snorkels, masks, beach mats, chairs, and a beach umbrella. Grab a beach towel, equipment from the box or picnic gear and go to one of the award-winning beaches just a few minutes drive away. Later grab a beach chair and watch the sunset over the ocean just steps from the house. Relaxing outdoors is easy in our privacy-fenced grounds. Outdoor spaces surround you with tropical landscaping, grass and custom art glass. E.W. says, "The outdoor shower is so nice when you come back from the beach." Landscape lighting creates a tropical evening scape. Puako nights and stargazing is another wonderful experience. Don't miss the spectacular rising full moon whit Mauna Kea in the foreground, or watch Mauna Kea turn purple at sunset! Vintage Beach Cottage awaits you! Picture yourself resting in the hammock under cool shady trees, grilling the local catch of the day, dinning on the patio under the stars, reading a book under shady trees on the lawn chairs, refreshing after a swim in the outside shower surrounded by scented ginger, fragrant jasmine, and stephanotis vines, or enjoying the tropical garden with morning coffee and a newspaper under the covered lani. Homeowners are extremely respectful of their guests privacy and live on a property next door. Having quick response for guests comfort, resources information, and emergencies is a benefit service for guests. There are many activities in Puako for guests to enjoy without going back on the main highway. Take a walk in our picturesque neighborhood, listen to birds wake up in the morning, jog, explore the Puako petroglyph fields, hike to Waialea Bay (beach69) on the Ala Kahakai National Historic Trail , bike jog or walk on Old Puako Road to Hapuna Beach and take a swim in this award winning beach. Head south and access the Mauna Lani Resort's historic fish ponds. Whatever you choose, kayaking, snorkeling, swimming, diving, turtle, dolphin or whale watching, you don't have to leave the Puako area to have all this fun! Nearby resorts offer world class golf, tennis, fine dinning, and shopping. Many Vintage Beach Cottage guests volunteer for Keep Puako Beautiful and South Kohala Reef Alliance's(501c3) programs. Keep Puako Beautiful's Ocean Environment and Education Station projects promote marine conservation. We offer guests information on activities related to conservation in West Hawaii like beach cleanups, recycling, and reducing plastics in our ocean environment to help them understand how valuable these conservation activities are to maintaining a clean and healthy Hawaii. We were blessed with 800 Volunteers and partners and from 4 to 78 years old attended our beach cleanups, workshops in 2017. We reserve the right to refuse service to anyone, all house rules, rates and fees are subject to change without notice. We have a strict refund policy. Guest pays credit card fees if they cancel all or any part of their reservation. We feel fortunate to have been in Puako since 1979. Many changes have taken place but we couldn't have wished to be any where else! We spend much of our time caring for the Vintage Beach Cottage and various reef conservation projects. We engage with many partners who enjoy taking care of Hawaii and keeping it sustainable for the future. Our tax exempt status results in reduced rent to guest. Book a reservation and save with us. My neighbor and her husband were the inventors of Loco Moco, a popular Hawaiian dish. She would always say to me as we turned off the highway and were dropping into Puako, " There is no place like Puako." We carefully outfitted our property to make your vacation unique and enjoyable. This is a home away from home. Many guests immediately refer to Vintage Beach Cottage as "Home." Our 501c3 non profit partner is South Kohala Reef Alliance. Guests rent is tax exempt, we do not collect GET or TAT taxes which is more then a 13% savings. We educate our guest about Hawaiian resource conservation through printed materials provided on site or activities our conservation partners have on the island. toilet, tub, shower, Shower supplies include a variety of shampoos and soaps. shower, Outdoor shower, shampoo,soap, sink, mirror & bench. Wood paneling, shelves for storage, first aid supplies, soaps, shampoo, hair dryer, Hawaiian and ocean theme art, and a large supply of bath towels. Located on a public beach access and just 200 ft from the ocean , tide pools, turtles and sand, and sunsets. Mauna Kea, Hapuna Beach Hotel, Mauna Lani, Fairmount Orchid, and Waikoloa resorts can be reached within 15 or less. Vintage Beach Cottage is located in a rural area. Expansive undeveloped land surrounds us. The 600 acre Hapuna Beach State Recreational Area and 650 acres behind our village. We watch the Kohala mountain range change colors with the seasons as well as Mauna Kea and Mauna Loa. Air Conditioning; Option in, activate and pay on arrival. High thread count bed linens are professional laundered. Eco friendly laundry detergents, cleaners, and cleaning supplies. Service area has a beach towels stack and laundry basket. Iron, hats, beach and shopping bags. Ironing board in the kitchen cupboard. Driveway parking for 1 car. Garage parking for 1 car. Beach gear box; chairs, mats, umbrella, water shoes, and more. Wifi and password internet access. We have bath sheets, bath towels, hand towels, mats, face cloths and makeup cloths. Vintage rattan sofa, 2 club chairs, 2 end tables and coffee table, reading lights, fans, Hawaiian art, Hawaiian nature resource books, guide books, cards and novels. 4 ft. side X side. Contents could be caned and bottled beverages, oil and condiments. Everpure water filter feeds automatic ice maker. Electric 4 burner with down draft fan. Electric thermo craft. Electric tea kettle, blender and immersion blender. Coffee, tea, white and raw sugar. Spice drawer, plastic wrap, foil and shopping bags. Dishes, serving dishes, bake ware, measuring cups, salad spinner, BBQ tools & wok, pizza pan, serving trays, 2 sets of eating utensils, mixing bowls, knife block, sharpeners and vegetable steamers. Cutting boards, S/S pots pans, spices, foil, plastic wrap, picnic coolers, soaps, paper goods, napkins and placemats, blender, immersion blender, dish towels, pot holders and aprons. Dinning nook bench outfitted with pillows, cushioned window seat, dinning table with shell inlay, vintage rattan chairs, and retro surf theme. Smart TV, home theater system. Roko & Netflix. Hard and soft cover novels, Hawaiian nature and resource books. Lush grass, large false kaumani trees for shade, hammock, landscape lighting for enjoying the garden at night. Lawn chairs and table provide seating to relax and read a novel. Kayak can be launched 200 ft from us. Kayak tours leave daily steps away. Kayaks can be rented through local vendors. Puako Boat Ramp; snorkel, dive, manta ray and whale watch boats leave daily. 1/2 mile from us. Seating for 2, umbrella for shade, side table, tropical garden and teak bench. Garage box has some water gear. A local Puako diving company has rental gear as well as diving and snorkel vendors located at the Mauna Lani Resort, Queens Shops, or the town of Kawaihae. 10 minute drive to tennis courts at nearby resorts. 10 minute drive to golf at nearby resorts. Loved loved loved our stay at Vintage Cottage in Puako. When we walked into Vintage Cottage, we knew we had found our little corner of perfect. Everything we needed was supplied by Cynthia & John, all we had to do was unpack. No detail have been left out. Their beautiful beach cottage made us feel a deeper connection to the Hawaiian culture. The modern updates blending with their traditional decorating makes it magazine worthy!! The kitchen and all the supplies & equipment made it so I could even make cookies !!! The private yard with several different sitting areas, and the outdoor shower made the outside just as inviting as the inside. Wish we had longer ( and we've already been here 10 days). We'll be back....and can't wait. Thank you Cynthia & John !! This is a most complete cottage with every convenience of home. Cynthia has thought of all of the needs for enjoying the area. The picnic gear, cooler, kitchen wares and beach box make the stay great! Proximity to beaches and walks is prime. Body surfing, snorkeling and great beach wandering is right out the door. Add the host being available, knowledgeable and most respectful makes this a perfect destination. Quality in all aspects! Thank you for sharing such a nice guest experience review about your stay with us! We enjoyed having you as guests and hope to see you again. We appreciate your sharing how much you enjoyed our cottage and the Puako Beach area. We enjoyed having you as guests and hope to see you next time you are in Hawaii. Thank you for sharing such a nice review of Vintage Beach Cottage, your new home away from home! We will definitely stay here again if we come back to the big island. House had everything we could possibly need. It felt like home. Loved the outdoor shower and the box that had everything we need for the beach. Thanks for making our stay a great one!! Thank you for sharing how much you enjoyed home! Must do activities; Ride the manta and whale watching boats that leave from the Puako Boat Ramp, just .5 miles from the cottage. Take a snorkel kayak tour of the Puako reef, just a 5 minute walk from the cottage. Hike and explore the Puako petroglyph fields. Visit and swim at award winning Hapuna Beach. Take a dip in the Queens bath, visit the Eva Parker Woods museum and historic Hawaiian fish ponds at the Mauna Lani Resort. Don't forget there are 4 National parks on the Big Island. Pu'ukohola heiau National Historic site is 6 miles away. World class golf within a 10 minute drive.